If you have played air hockey then for sure, you must have a desire to own an air hockey table. In case if you aren’t a big fan of air hockey then also buying air hockey table for your children sounds like a great gift idea. You can bring the fun of air hockey right into your entertainment or living room. You should know one thing though that home air hockey tables are surely durable, but are smaller in size than professional tables. This very feature has been included in air hockey tables designed for home use intentionally. 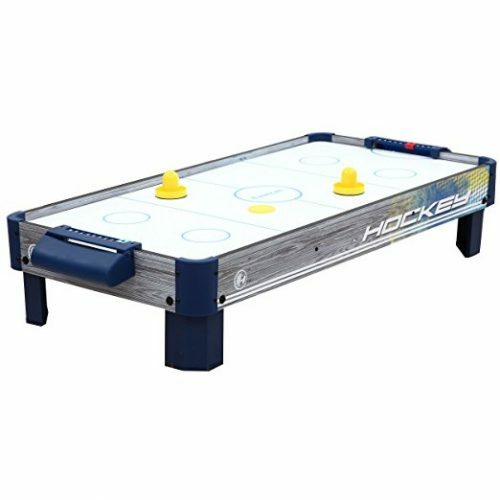 The small sized air hockey table can fit easily anywhere in your house, and the smaller sized air hockey tables also act as a great gift idea for children. If you are planning to buy air hockey table, then you must consider having a look at our list of the best home air hockey tables. If you have a desire to avoid the unnecessary and confusing task, then you can take the help of the list of the best air hockey tables available in the market. If you are looking for a beginner level affordable hockey table, then the Sport Squad HX40 is an ideal option for you. We will recommend this product primarily for children as it is smaller in size. The only turn down is that it doesn’t have legs which means you will have to place it on a table or on the non-carpeted floor (on the carpeted floor the motor gets overheated). The build of quality of this hockey table is great, and the powerful motor gives sufficient cushioning effect for the puck. The best thing about this table is that it is highly durable therefore a few rough sessions will not result in any damage. This table comes with manual score counters located above the goals for keeping track of the game. The Voit Playmaker Air Hockey Table is a great table tennis/air hockey table that your children will surely love. This convertible table is designed specifically for children, and if you want to expose your kid to this game, then you should surely buy this convertible table. This great starter kit allows your kid to play two games in one place. One of the features that really attracted our attention was the presence of the electronic LED scoring. You will get a 110 Volt air blower with it. 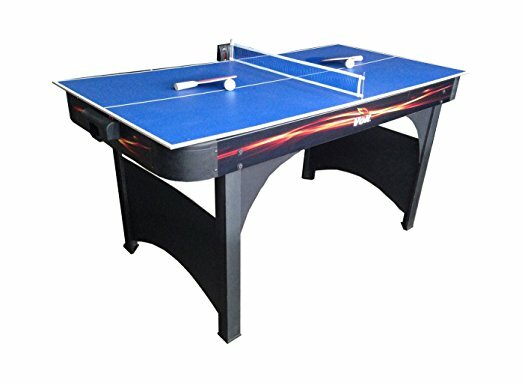 This table tennis/air hockey table comes with legs which means you won’t have to dedicate a table just for placing it. If you love air hockey and if you are looking for an air hockey table that could fit your tight budget then rest assured you will surely find the Harvil 40-inch air hockey table an ideal match. The electronic scoring of the table allows you to keep an accurate track of the goals made. The best thing about this table was its curved panels between the legs which eventually will help you in saving space. Therefore it can be said that this table is ideal for use in your child’s bedroom or living room. This table is lightweight and portable. It comes with 110 Volt motor that produces a good amount of air for smooth play. The best thing about this hockey table is that it also has manual scorers. The Playcraft Sport Breakaway Air Hockey Table is a quality air hockey table that will be in your house for years. This durable and highly sturdy table can take a lot of rough sessions that too without getting damaged. The Playcraft Sport Breakaway Air Hockey Table features a high-speed fan motor for offering great cushioning effect, and in addition to that, it also has a high glossy playfield for offering a smooth play. 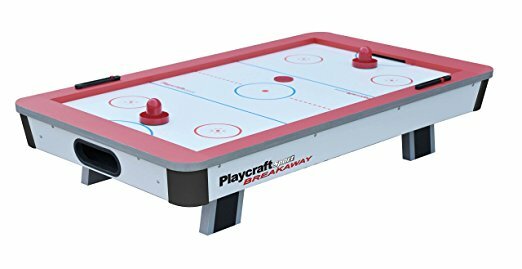 The best thing about the Playcraft Sport Breakaway Air Hockey Table is that it is lightweight which means you can easily move it from one place to another. You can keep track of the scores with the help of plastic slide scorers. Comes with an expensive price tag. The playing surface of any air hockey table is the most important part that one should give special consideration while buying one. The surface should be as smooth as possible so that the puck can move freely. 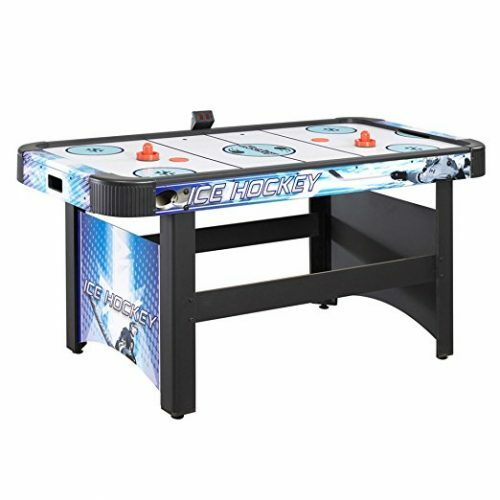 This is the reason because of which the EA Sports 60 Inch Air Powered Hockey Table features high glossy finish playing surface. 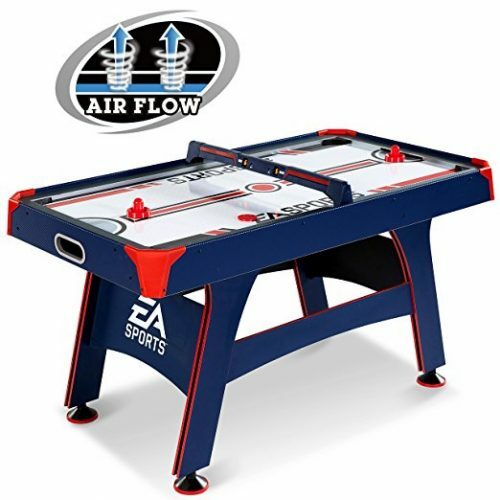 You will get 120 V blower fan with this air hockey table which means that you will have strong air flow. 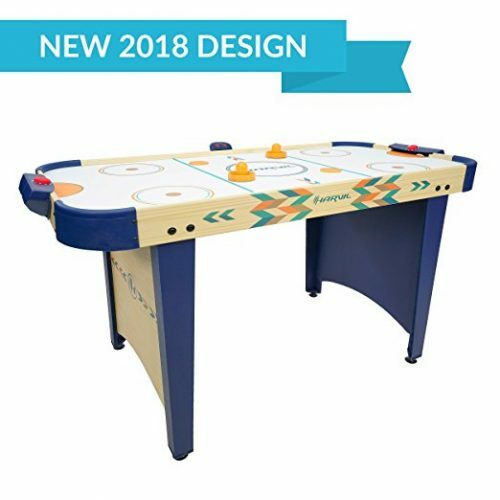 The EA Sports 60 Inch Air Powered Hockey Table is an ideal option for families with kids because this air hockey table has integrated cool and amazing sound effects, and LED electronic overhead scoring. 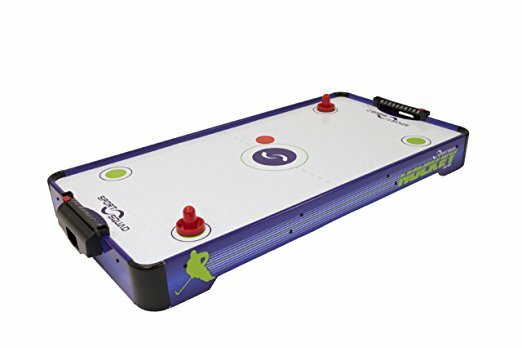 You can keep your competitive spirit buzzing and reflexes sharp with Harvil 4 foot Air Hockey Table. This great air hockey table is made of highly dense fiber wood which can withstand numerous rough sessions without getting damaged for a long duration of time. This space-saving air hockey table is ideal for casual as well as tournament play. The play area is ultra-smooth and aesthetically appealing. The powerful electronic blower which comes along with this table gives great cushioning to the puke for smooth play. The best part is that it is easy to assemble. The Hathaway Face-Off Air Hockey Table is one of the most popular air hockey tables among numerous families. The best thing about this very air hockey table is that although it is very affordable, you will not have any complaint quality wise. If you are looking for a way to pry away your kids from their gaming consoles and smartphones, then you should consider buying this great air hockey table. It is easy to setup this air hockey table. The predrilled holes and well-arranged pieces inside the packaging makes the assembly task a lot easier than one can expect. This tough air hockey table isn’t made of plastic but is made of MDF, and this material gives the Hathaway Face-Off Air Hockey Table durability and strength. You will also get electronic scoring system along with this very product. You should know that for powering up scoring system you won’t have to employ any separate power source (such as batteries), just plug in and gain access to all the features. This great air hockey table comes with a reasonably sized blower motor. For sure you will not get the best item available in the market at this price. However, you will surely be surprised how well this hockey table can perform. Though you might find a number of PlayCraft air hockey tables built specially for pros, but this table that we have enlisted here on the list isn’t for pro. It is designed and built to be ideal for beginners, families, or intermediate players. For sure it isn’t built for pros, but this doesn’t mean that this table won’t play well. In reality, it is one of the best air hockey tables available in the market in this price bracket. However, you shouldn’t expect it to give you the unexpected silky smooth action as you might find in tables that are built for competitive use. You will have to dedicate a good amount of your valuable time for assembling this table. Triumph created this great air hockey table in order to give air hockey lovers a great table that isn’t only highly functional but is also a bit different aesthetically. 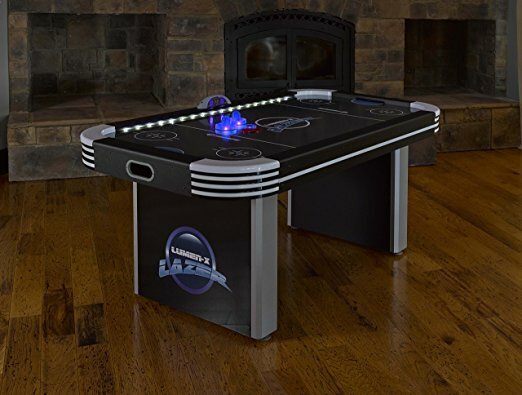 The black design of the table incorporates light gray, bright blue and white shades for offering the table a unique look and for making this table the center of attraction of one’s game room. The Triumph Lumen-X Lazer 6′ Air Hockey Table also features numerous small light around the edges that adds a touch of excitement to this regular game. In a true sense, this is a great table for you if you like collecting attractive and unique things. Blowers could have been more powerful. 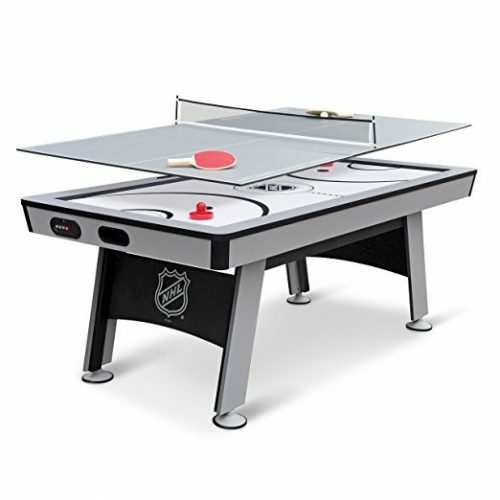 Believe us you will not get a better deal than the one you are getting with the NHL Power Play Hover Hockey Table with Table Tennis Top. 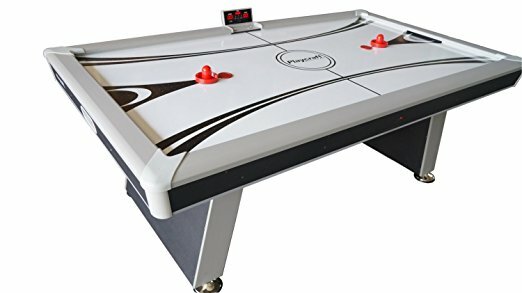 Considering the reasonable price and the quality of this air hockey table that incorporates both air hockey as well as table tennis into a single unit, it will not be wrong to say that the manufacturers of this very air hockey table are offering you a great deal in exchange of your money. The playing surface of this very air hockey table is scratch resistant which means that this very table will last for years. You will be able to start playing table tennis or air hockey right after taking the NHL Power Play Hover Hockey Table with Table Tennis Top out of the box as this air hockey table can be set-up in few minutes only. Is a bit expensive but is worth every single penny. Owning an air hockey table has its own pleasure. You will have a great tool to keep your whole family busy and entertained. People of all skill levels and ages can enjoy this game. 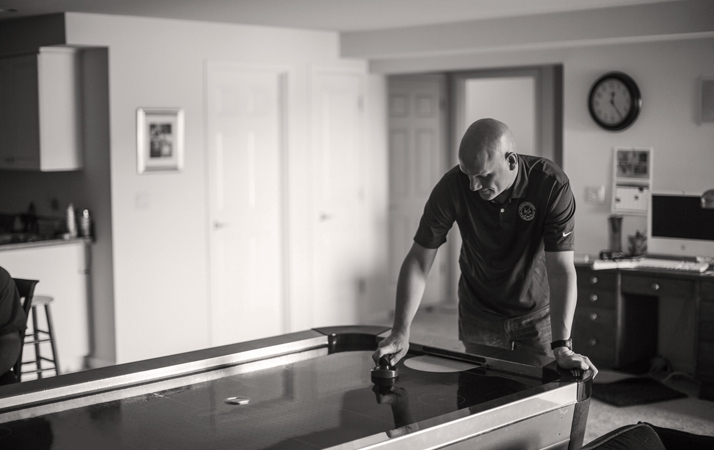 There are a variety of air hockey tables available out there in the market, and the selection process is a difficult task, but you will have to carry out your own research for finding the right product. You will have to decide your budget; will have to determine the available space in your house. Know this fact that there is a table present for all skill levels. Giving your hard earned money for a pro table will not be a wise decision if are just a newbie. Rest assured you will find the right table from our list.